Following the release of the Tar LP on Australian label Damned Gates, the Tar CD variant includes new artwork and four bonus tracks. Many have tried to synthesize the endearing and haunting styles of gothic rock, death rock, and French post-punk, and nearly all have failed or come across disengenuous and contrived. 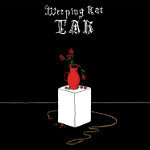 Weeping Rat traverses these genres, blending even more and coming across every bit as genuine as those that pioneered said musical dimensions, all while operating in their own unique space, pushing boundaries even further.